Siam Kyudo Kai: Japanese Martial Art in Thailand. Japanese Martial Art in Thailand. 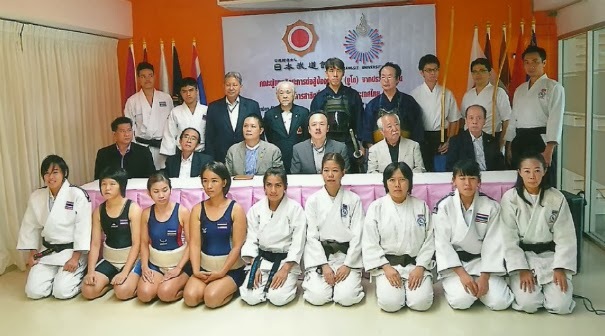 Press conference for 1st budo demonstration in Thailand, 23 June 2013. Early in 2013, we have participated in organizing the first Budo demonstration event in Thailand. It was held to celebrate the 40th year anniversary of cooperation between countries in Asia and Japan by Nippon Budokan Foundation. It is also the first time that we have met other budo practitioner group in Thailand. (Aikido, Judo, Karate, Kendo, Sumo). Some group has very long history in such as aikido, since BE.2504. We learn about each other group. At the same time, it make us realized that Budo(Japanese martial art) is very popular in Thailand. Katsushika-san, our senior, has mentioned that we should have a budokan stadium as a center place for all budo and culture exchange in Thailand. I also agree. In the Budokan demonstration event on this 17 November 2013, visitor will be able to experience the demonstration by high rank budo practitioner from Japan. Also, in case that anyone want to start practice, you will also have a chance to communicate with local budo group as well.